Located just 7 km from the centre of Gliwice and near several major motorways, this family run guest house is the ideal place for a comfortable stopover. W Starym Ogrodnictwie has a tranquil location surrounded by fields and woodland. The 5 comfortable rooms are 25 m² in size all include a private bathroom with shower. All room prices include breakfast, while lunch and dinner are served on request. When the weather permits, you can relax or enjoy a BBQ on the terrace in the garden, where you will also find a children?s playground. 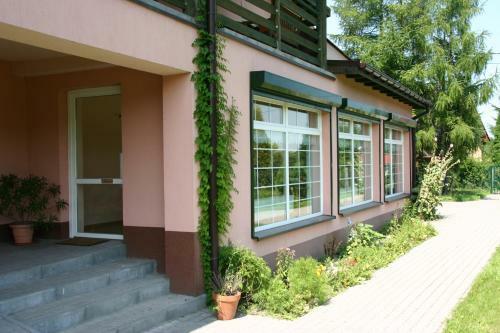 Write a review for Pension W Starym Ogrodnictwie (Przyszowice Slaskie Poland) now! Upload your holiday pictures and holiday videos! Located just 7 km from the centre of Gliwice and near several major motorways, this family run guest house is the ideal place for a comfortable stopover.